For as far long as I can remember, I have always either paid by cash or credit card. Whenever possible, I paid by credit card for my cash back benefits. The only time I paid cash is when credit cards were not accepted by the merchant. Often times, paying by credit card is faster and more convenient than cash. I love using my credit card wherever possible. But after a series of headline catching incidents where large number of credit card numbers were stolen from merchants, people now better understanding the insecurities of credit cards. And to think, all a credit cards is comprised of is a 16 numeric digits, 4 digits representing a date, and 3 digits code. A majority of that information is available right on the front of the credit card. Worst of all, your credit card information is stored digitally by the merchants whenever you swipe a card. Once digitized, this pool of information becomes a prime target for hackers. 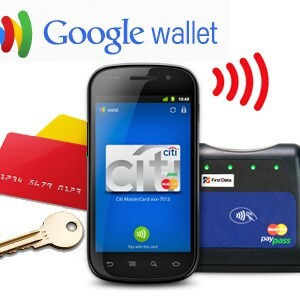 But now, Google Wallet is creating a safer environment for consumer's to pay with credit cards. To use Google Wallet, there are requirements. You must have a smartphone with NFC, install the Google Wallet app, register your credit card with Google Wallet online, and pick a 4 digit pin. After that, you can pay merchants by tapping (instead of swiping) your NFC enabled smartphone at NFC capable card readers, and entering your 4 digit pin. NFC stands for Near Field Communication and defines how payment is transferred. Payment is transferred via NFC, but instead of sending your credit card, a virtual credit number is sent. It is safely implemented. Even with NFC enabled, payment can only occur if the Google Wallet app is running and the 4 digit pin is active. Payment process is as easy as swiping a card. Google Wallet also saves store loyalty cards. Your information stored on special chips in your phone. If he chip is removed, information is deleted. You don't need wireless service to pay at card readers. Final payment still made through your credit card, so you continue to get benefits like cash back. You can't pay with Google Wallet if your smartphone is out of batteries. Losing your smartphone means you should de-activate your credit card. Overall, I love the idea of payment via smartphone. Most people have a smartphone. With Google Wallet and the virtual credit card number, safety makes a lot of sense. However, the biggest roadblock to Google Wallet becoming a reality is the lack of support. All but a handful of merchants, do not have card readers capable of reading NFC devices. So despite the want to use Google Wallet, there aren't many places to do so. Credit cards companies do not support Google Wallet, and instead prefer to implement their own system. Square seems to be the latest craze in alternative forms of payment, but continue to rely on unsafe nature of credit cards. Despite what seems like an impossible hurdle for Google to gain support, I do hope that someday, Google Wallet and other providers can make headway in creating a safer environment for credit card usage.